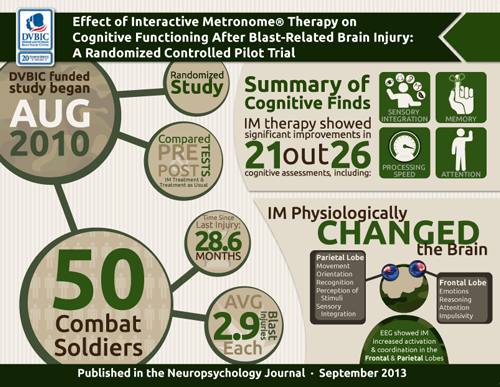 In 2011, researchers at the Defense and Veterans Brain Injury Clinic (DVBIC) at Fort Carson, CO, began a research study on the effects of Interactive Metronome for treating mTBI. The results were overwhelming positive, and published in September 2013 in the peer-reviewed Neuropsychology journal. Please click through to read this study and learn more about additional research conducted over the past 15 years. Preliminary findings of a randomized, controlled study concerning the efficacy of IM for remediation of cognitive deficits in active duty soldiers following blast-related mild-to-moderate TBI. Compared outcomes of standard rehabilitation care alone (OT, PT, SLP) to the same standard rehabilitation care + 15 IM treatment sessions. The group that received IM in addition to standard care outperformed the group who received standard rehabilitation care alone on several neuropsychological measures with medium to large effect sizes. Future publications based upon this study will reveal the results of 6 month follow-up testing (still in process) and analysis of electrocortical (EEG) data.